In case you did not catch the fine print: This book is unofficial and unauthorized. It is not authorized, approved, licensed, or endorsed by Suzanne Collins, her publishers, or Lionsgate Entertainment Corporation. I get the feeling they are not even friends on Facebook. Having reviewed Creek Stewart's Bug Out Book, I was keen to read this book. The first thing it did was get me interested in the Hunger Games books which I have not read (nor have I seen the movies). I assumed the books were all about kids killing each other. Turns out there is a lot of survival stuff as well. Bonus! Creek has obviously aimed this book at a younger audience and he has heavily based the narrative to match the Hunger Games. There are sponsors tips and lot of references to the characters and events in the books. Nevertheless it does offer some very useful survival advice. While not as comprehensive as it could be, it does make for a good refresher in the basics. 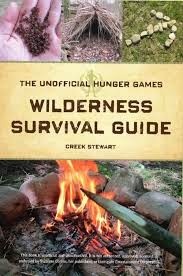 Starting with the Survival Mentality it then covers the main essentials of shelter, water, fire, tool, food, first aid and navigation. There is cool stuff like making a Dakota fire hole, using iodine to disinfect water and making "prison rope" from toilet paper. Sadly there is nothing about fighting off zombies but I guess that's because they never featured in Hunger Games.